Turkey’s political parties are (mostly) scrambling over each other to nominate more women. 7 April was deadline day for Turkey’s political parties wanting to nominate parliamentary candidates for the general election. Plenty of the coverage was dominated by the pro-Kurdish People’s Democracy Party (HDP), which has nominated a record number of women. 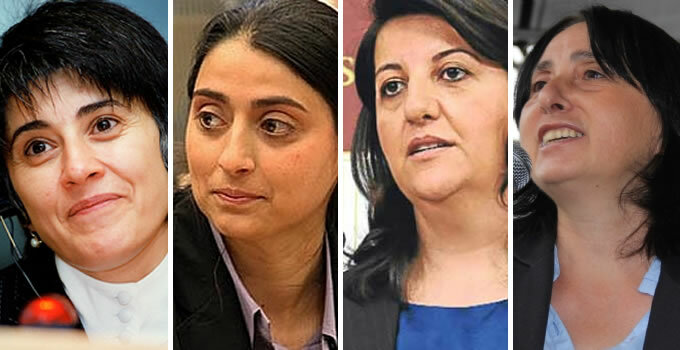 286 slots – a little under half the 550 available – went to women in the HDP’s candidate list, far outstripping those nominated by the other three main parties – and indeed any Turkish party ever. The centre-left Republican People’s Party (CHP) came second, with 103 women candidates, a paltry four nominees ahead of the 99 women nominated by the governing Justice and Development (AK) Party. Of the 550 nominees standing for the right-wing Nationalist Movement Party (MHP), meanwhile, just 40 are women, suggesting attitudes have not moved too far since the last election. That was when the leadership encouraged MHP men to instruct their wives on how to vote. For those fighting for increased representation of women in Turkey’s parliament, more women on party candidate lists can only be a good thing. But the real question should be how many women are nominated for winnable seats? CHP leader Kemal Kılıçdaroğlu declared a fortnight ago that his party would ensure women took all the top slots in Istanbul, Ankara and Izmir, Turkey’s largest cities, thus guaranteeing they would be elected. A quick look at the CHP’s candidate list this evening shows he kept his word. But what about the HDP and its near-gender balanced list? A party could easily nominate hundreds of women but place them lower down the list in unwinnable districts, making a seat in parliament an impossible prospect. 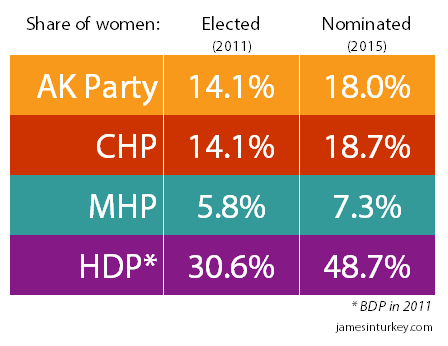 How many HDP women are likely to win a seat? The answer lies in the number of overall seats the HDP is projected to win, provided it crosses Turkey’s 10 percent electoral threshold. Based on polling trends, JamesInTurkey.com predicts the HDP would win 47 seats from 19 electoral districts. These include seats in southeastern sure bets like Diyarbakır and Van, as well as Istanbul’s three districts. Based on the candidate list published today, that means 19 HDP women would be elected to parliament. That’s 40% of the total. In Batman and Van, the HDP would elect more women than men, while in Bitlis and Istanbul’s 2nd district there would be no HDP men at all. In another six districts, the number of HDP men and women would be equal.